[approx 3 hours X53 bus back to studio]. 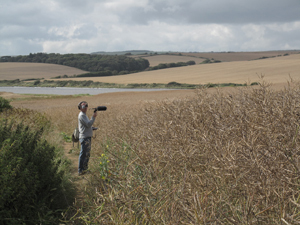 Meeting at 10.30am for 11am start from DIVAcontemporary Studio, Bridport, David Rogers and ivon oates will lead a participatory ‘soundwalk’ to West Bay. There will be opportunity to record ‘collect’ sounds that you find interesting, characteristic, out of place or even beautiful. The artists will then lead an afternoon workshop, introducing the participants to simple sound editing and uploading to the radio aporee maps projects. World Listening celebrates the practice of listening to the world around us, increasing our environmental awareness. The day is an opportunity to explore through listening, create and share soundscapes. WLD is co-organised by the World Listening Project (WLP) and the Midwest Society for Acoustic Ecology (MSAE). This entry was posted in associate artist, audio, David Rogers, ivon oates, links, Mandy Rathbone, partnerships, radio, soundscape. Bookmark the permalink.